As well as the movement of electrons, the movement of ions is an important part of oxidation-reduction reactions. Electrolyte: A substance which, when molten or in solution, separates into ions and conducts electricity. 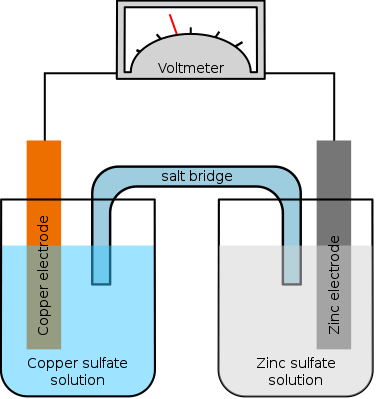 The strength of an electrolyte is determined by its solubility in water, as the more soluble a substance is, the more ions are available to transmit current. If a metal is coated with an ionic compound of a less reactive metal, the oxidation-reduction reaction will only occur on the surface where the metal makes contact with the compound. The less reactive metal ions are free to move towards the surface of the more reactive metal and accept electrons. Once formed, the more reactive metal ions are able to diffuse away and expose a new surface for reaction.